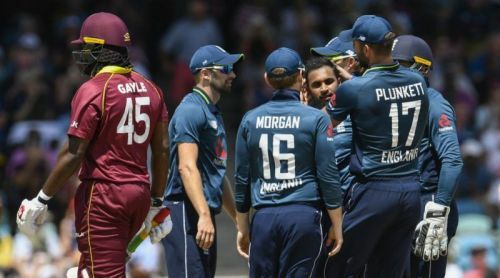 West Indies are set to host the English side for a three-match T20I series. The first T20I is scheduled to take place tomorrow at the Daren Sammy National Cricket Stadium, St Lucia. Then, the remaining two matches will be played on 8th and 10th March respectively. Both the teams will lock horns in the shortest format of the game, after playing the Test and ODI series. Windies emerged victorious in the Test series, while the ODI series ended in dramatic fashion with a 2-2 scoreline. West Indies have played some remarkable cricket so far in this home season. Having won the Test series 2-1, they looked in sensational form heading into the ODI series against the World No. 1 ODI team. After being on the verge of losing the series, they fought back in the final ODI to level the series 2-2. The hosts have to back their bowlers if they want to perform well in the upcoming T20I series. Chris Gayle, Shimron Hetmyer and Shai Hope will lead the explosive batting lineup against the mighty England side. England, on the other hand, are having a forgettable tour this time around in the Carribean. After a string of ordinary performances, England will be hoping to land a counter punch and seal this T20I series. Morgan and co. will have to play aggressive cricket in the remaining games if they want to end this tour on a winning note. Jason Roy, Jos Buttler, Moeen Ali and Ben Stokes have been rested for this series. Joe Burns, David Malan, David Willey, and Sam Billings are set to replace them in the squad. Joe Root still remains doubtful for the first game. Andre Russell has been ruled out of the series due to a knee injury. Jason Holder will lead the home side in the T20I series. Eoin Morgan(c), Sam Billings, Jonny Bairstow, Tom Curran, Joe Denly, Alex Hales, Mark Wood, Chris Jordan, Adil Rashid, Joe Root, Dawid Malan, Liam Plunkett, Sam Curran, David Willey. Jason Holder(c), Shai Hope, Shimron Hetmyer, Fabian Allen, Devendra Bishoo, Darren Bravo, Chris Gayle, John Campbell, Nicholas Pooran, Sheldon Cottrell, Carlos Brathwaite, Ashley Nurse, Oshane Thomas.